sanghawalks: Inspire u? Y u? Much of what I write is very earthy, sometimes it's not all that easy to accept basic dirt. So I all I can say is this, living is great as a Sangha. 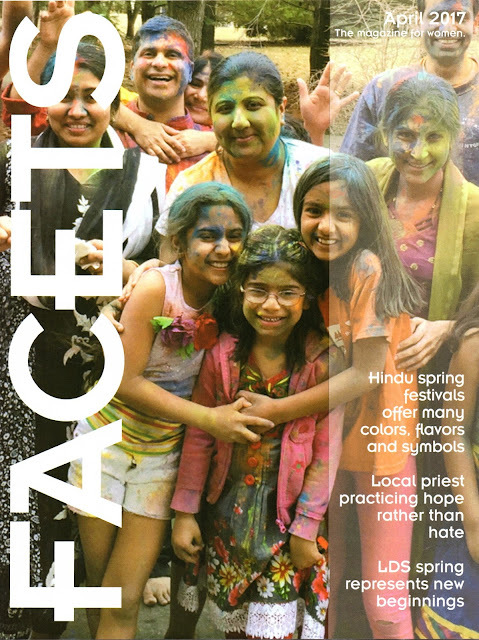 I am happy and in my element as a bhikshuni. It has definitely felt like fitting into a glove hand tailored just for me. 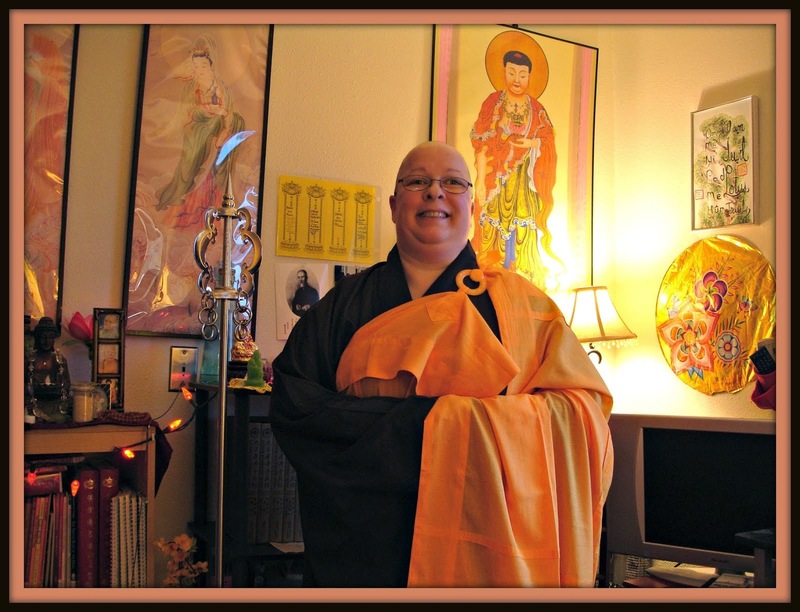 I love my robes and respect my tradition, I am grateful for this life that led me to take full ordination as a bhikshuni. I do not doubt the choice. I do not feel sad ever about uphold precepts, it's easy. I do not feel deprived of human affection for I get loads of attention. I became a bhikshuni in the Chinese Mahayana tradition and that is only because I have an affinity for Chinese culture, have family that is Chinese and long history with families and friends of Chinese origin. I'm not a commie (geese isn't that obvious!) and didn't magically turn into Chinese like many who on objected to my trying to save Tibetan monks from self-immolation accused me of being (how stupid is that!). I don't have to respect such monks, all Westerners full of polluted thinking. I am grateful for my choices because I got loads of benefits from getting closer and being around my growing daughter to see her now almost 21 this month, and so happy! Even though my tonsure temple was not the best for me, it was good that she was allowed to stay with me there and I kept in touch with her loads more than being in Iowa or California. Because of that she grew healthy and strong. And I saw it. I am so proud of her! She joined right in and even when it was difficult for her or uncomfortable, she kept happy and got a good grounding in Buddhist life in a temple. It is always inspiring for me to visit with other Buddhists, I am isolated here in Iowa from my Buddhist community, so I get on Facebook now almost daily. 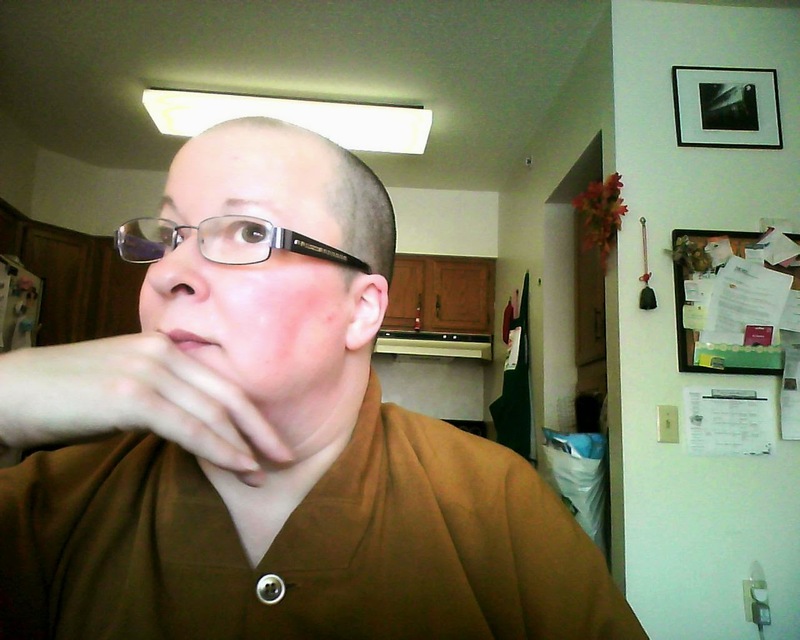 I love it, I get to visit with monks and nuns from all kinds of traditions in Buddhism. That is so precious to me, it helps me and sustains me while here in Iowa. Special mention, it's very common for monastics to have pets, mine is Pepper she is a rescued kitten in the first photo, right after having her fixed. And now a hefty fur ball that purrs when she decides you must sit on the couch so she can lay on or near your legs and snooze. I've promised the shelter she is with me for life, and she will be. I want her comfy settled and happy every day too. She snorted when I asked her if she wanted to take refuge in the Buddha and receive 5 precepts, so I took that as a no. Which I have to settle for it is her choice.